We already know what happens when Carolina Reapers Swing go on stage: the irresistible swing, the explosion of energy, the craziness — and not to forget the exquisite repertoire, the tenderness and the subtlety, the contrasts — and one sure thing: dancing won’t stop until that last note is played as they bring one hell of a party. 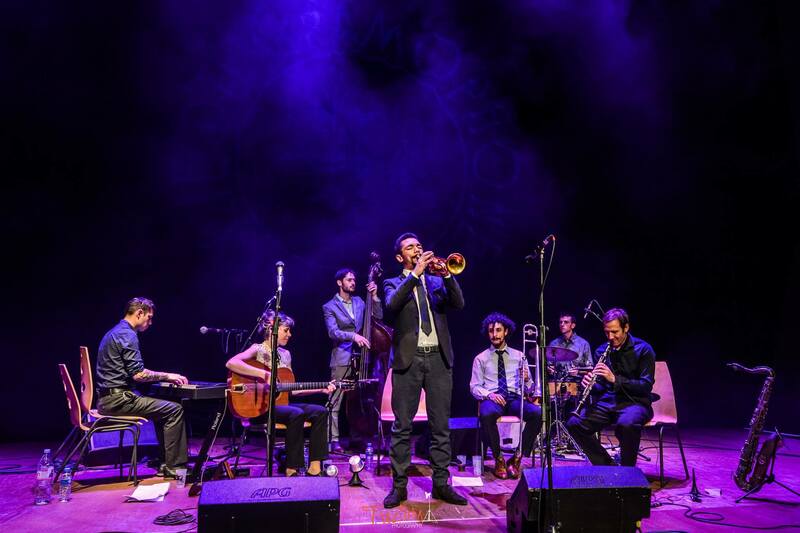 Fernando Morrison, musician and Lindy Hop dance instructor, called upon his favorite jazz musicians in Montpellier to create this swing dream team. Four gifted and creative soloists: trumpet and singer Benjamin Faconnier, trombonist Sami Khalfoune, clarinetist David Tavani and saxophonist Mickaël Pernet. Behind them, the solid and swinging rhythm section: pianist Joseph Vu Van, guitarist and singer Audrey Leclair, drummer Arthur Defrain, and Fernando Morrison, bassist and band-leader. Their performances are always surprising, full of inspiration and creativity, and you’ll never hear a song played twice the same way. Together they are a group of outstanding musicians and passionate individuals who take it upon themselves to make every Carolina Reapers Swing show a one-of-a-kind experience.